Professor John Deen is a distinguished scholar and researcher of veterinary medicine who has been actively involved in global engagement over his 18-year tenure at the University of Minnesota. After earning his doctoral degree in veterinary medicine from the University of Guelph in Canada, Dr. Deen began his career as a veterinary practitioner in swine and poultry health management. He eventually returned to academia to earn his Ph.D. in epidemiology, which set him on the course to become the renowned expert he is today. Dr. Deen is recognized around the world for his knowledge of swine health, productivity, and welfare. His extensive network of collaborators and his highly regarded reputation in the swine industry have helped to establish the University of Minnesota as a world leader in this area. Globally, Dr. Deen’s activities have ranged from assisting the developing swine industry in China to sharing disease control strategies in livestock in Thailand to advising government agencies on agricultural loss mitigation in Brazil. As a result of his international experience and reputation, he has become a trusted adviser on international livestock production to international agencies such as the Food and Agricultural Organization of the United Nations. At the University of Minnesota, Dr. Deen has played a key role in securing more than $90 million in external funding for veterinary and epidemiological research. Along the way, he has used his international projects to promote and build a remarkable level of interdisciplinary and cross-departmental collaboration across the University system. His work has opened pathways to meaningful international engagement for faculty and graduate students. Professor John Deen is recognized as a leading international expert in the role universities can play in improving their countries’ epidemic response systems. His global engagement has yielded multiple benefits to the students, faculty, and staff of the University of Minnesota. 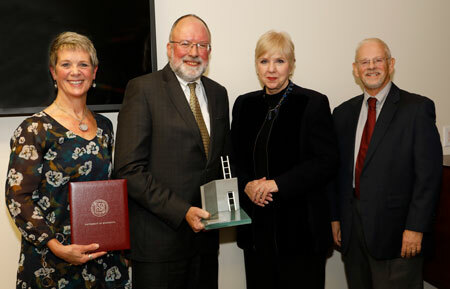 He has promoted interdisciplinary collaboration on campus and raised the visibility and stature of the University of Minnesota throughout the world.